or, "the feeling of being alone in the woods"
Today is a bit grayer – perhaps in mourning for yesterday’s events. It doesn’t stop the views from being stunning, even if we can’t see all the mountains. Our first leg, to Phunki Tenga (3250m) is what we’ve come to know as “Nepali Flat.” This is not the same as actual flat, which implies little, if any, elevation gain or loss. From Namche, we have dropped from 3440m to 3250 m. So really this should be considered “Nepali Down.” In reality, it’s a series of steep rolling hills with little net gain or loss. I’m becoming convinced there is no such thing as actual flat here. We make good time though, and by 9:30 am we are snacking by the river crossing. This is key, because the second half is “Nepali Uphill,” otherwise known as millions of stone stairs and steep elevation gain, with some Nepali Flat in the middle. 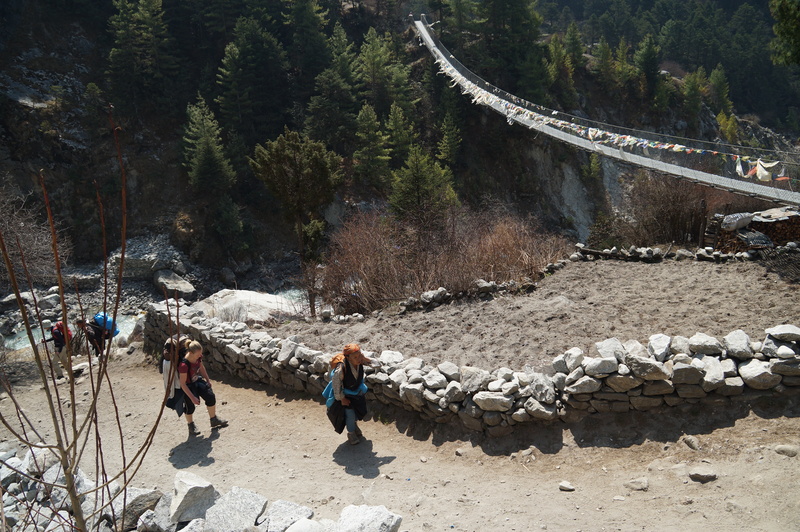 It’s not as punishing as the steep climb we did into Namche, but it requires a slow, steady pace. 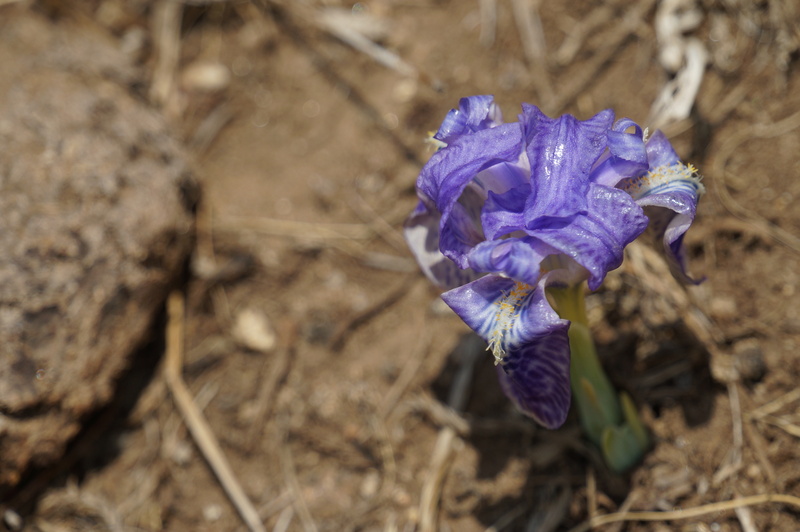 To make up for the pain, the trail is lined with rhododendron and beautiful purple flowers. 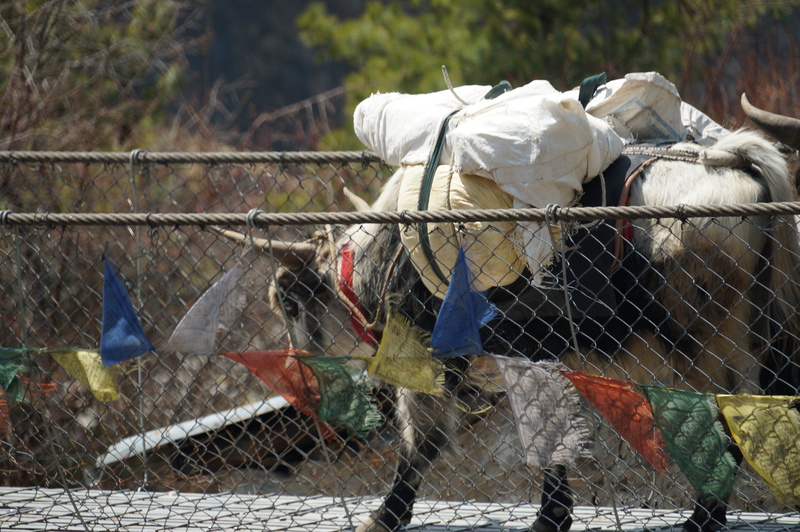 We have at least one yakfic jam (as I’ve dubbed them) – a pile of trekkers stuck behind a slow and plodding yak train. It takes a good 20 minutes for us to squeeze past, and Wes is nearly pushed off the trail in the process. 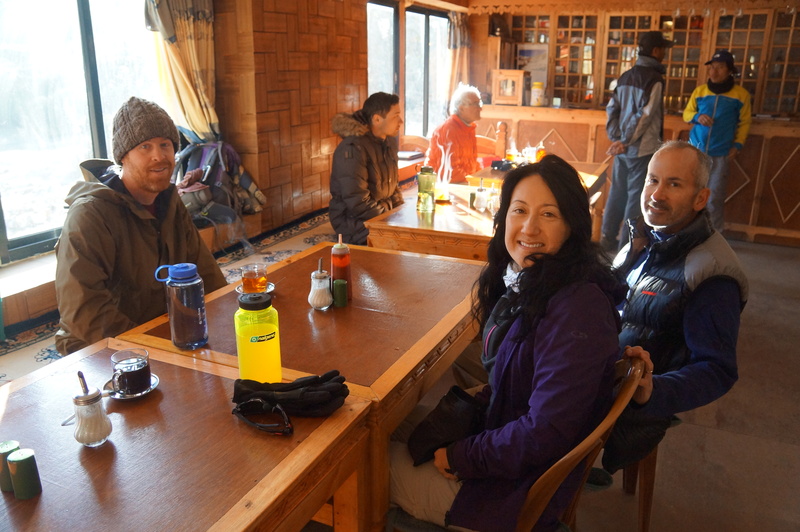 We arrive in Tengboche with plenty of excess energy. While Tom and I wander off to take pictures, Wes sees a red panda. He thought it was a giant red squirrel, but those are not native to the area. Color me jealous. The elusive red panda. Or at least the only one I’ve seen. 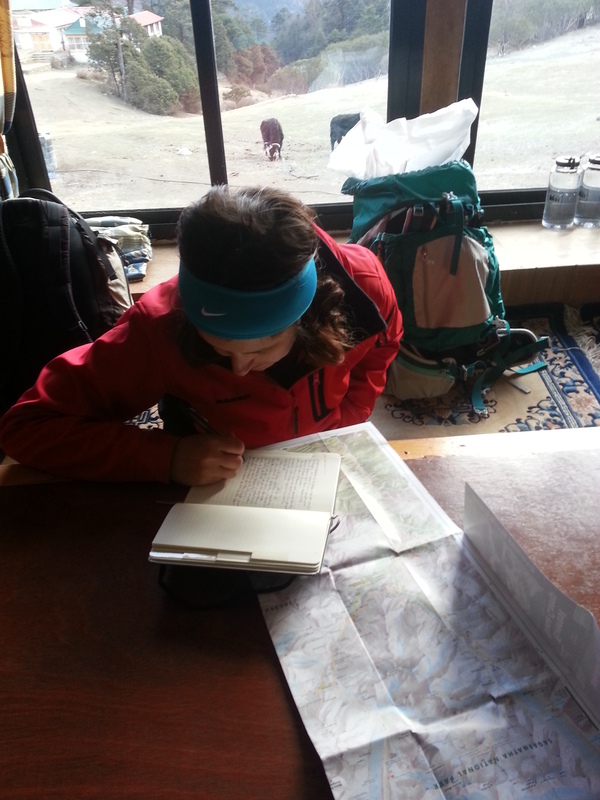 We spend the next few hours reading and relaxing while we wait for a good time to visit the famous Tengboche Monastery. 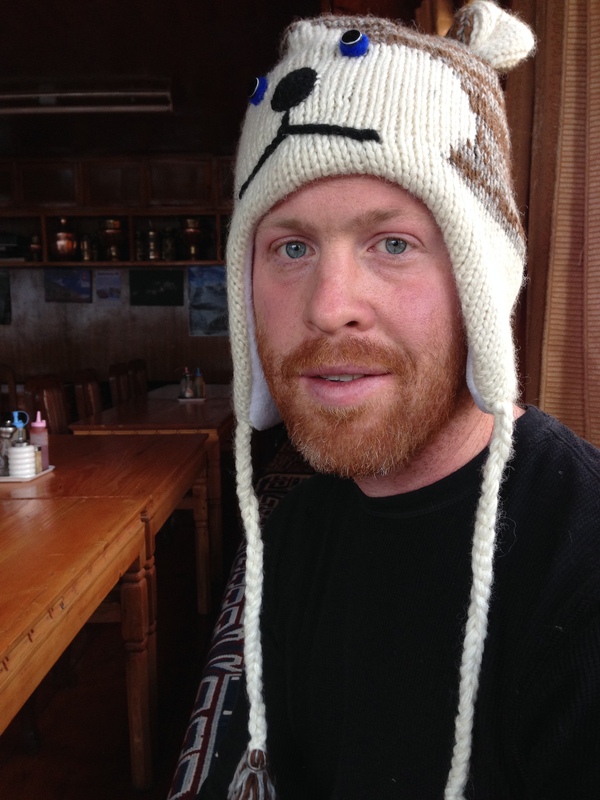 I’m sad to learn they don’t have any yeti skulls to see, and am reminded of a story Karma told us over lunch in Khumjung: There were yetis in the village who would tear up all the crops at night. One smart boy noticed that the yetis would do whatever they observed the villagers doing during the day. One day, he had the villagers drink a lot of wine, and then enact fake battles. That night, they left wine and real swords for the yetis, who killed each other that night in epic battle. Only one escaped. How I spent my afternoon: journaling. At 4 pm we headed over to the monastery to watch a traditional ceremony. It entailed sitting cross legged on a cold floor for about 90 minutes while the ceremony takes place. I was wishing for one of the warm robes the monks were wearing. It was a strange confluence of old and new – monks in the traditional orange robes but top of the line footwear, and the lama wore sunglasses inside. I don’t blame him – the incense was getting to me and maybe that would have helped. The monks chant almost continuously, with a lead monk chanting into a microphone for us all to hear. Periodically it is interrupted by dissonant music – horns, cymbals, drums, bells… One rude tourist ignores the “no pictures” rule and is scolded. The monk who catches him makes him erase them all off the camera. Several tourists present the lama with white scarves for a blessing. After making food offerings to the monks and at the alter, one of the monks offers us chocolate bars, tibetan bread, and prawn crackers. We’re not sure if we’re supposed to eat them or not, and look to the guides inside to see what they do. Snack time it is! 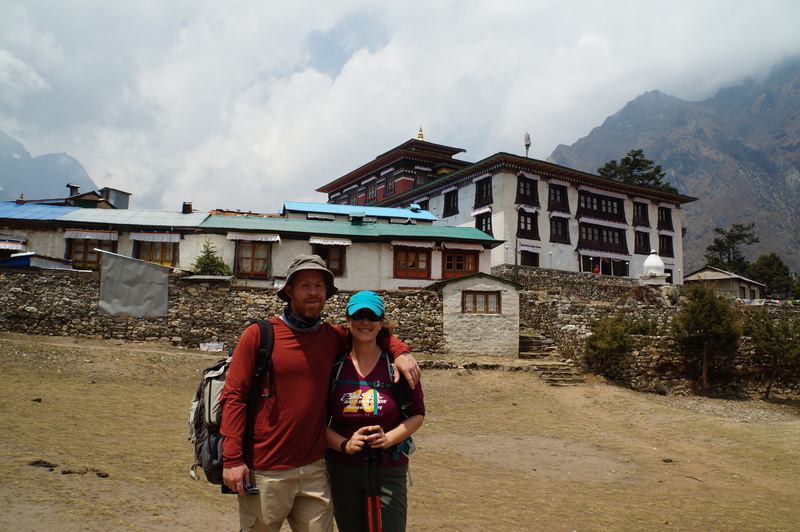 Wes and I with Tengboche Monastery in the background. We spend the evening in the dining room eating dal bhat and chatting with our neighbors. We’re looking forward to heading deeper into the Khumbu region tomorrow. Dining Room at Tashi Delek Lodge. An avid hiker, and allergic to most edible food. Sharing my travels, allergen-free eating tips, and general ramblings. This entry was posted in Everest, Nepal, Travel, Trekking and tagged Nepal, trekking. Bookmark the permalink.